There are quite a few questions – and unresolved matters of opinion – on the technical matter of rosin use on violin, viola and cello bows. It’s common for beginning, intermediate and advanced players to ask, “Which rosin is right for me?” Unfortunately, there is no single or simple correct answer. The reason for this is there are too many variables. A concertmaster from Helsinki might need entirely different rosin for performing in Havana – because of the effect of temperature and humidity on the substance. 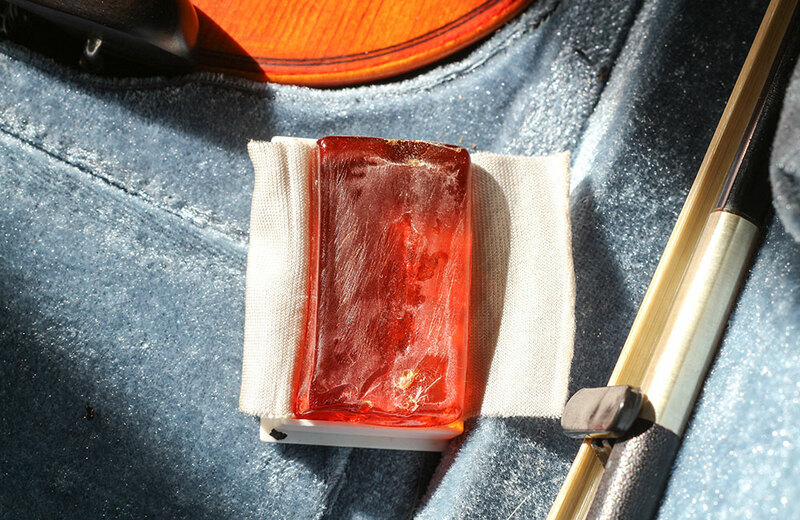 A violinist may be comfortable with one type of rosin early in their training then switch to a different rosin later because he or she discovers they get a different, richer sound as a result of the new rosin. For the most part, finding the rosin for your stringed instrument bow is a matter of trial and error – and, personal preference. A rule of thumb is that the larger the instrument, the softer the rosin; so the rosin for a violin bow would likely not be ideal for a cello. 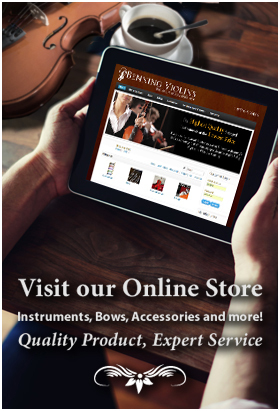 At most violin shops – brick and mortar or online – you will find rosin made specifically for specific instrument bows. Consult first with your teacher, and second with your local violin shop, if you are a new violinist or are unhappy with the rosin you are using. They should be able to provide specific ideas for you to try, depending on your instrument and the sound you wish to produce. That said, understanding the very nature of rosins is going to make you better able to understand what to expect from what is essentially tree resin. Called colophony or Greek pitch, rosin is a sap derived mostly from conifer trees. As a product of nature, it comes with variations. Rosins from Indonesia, China and Vietnam – where the majority of rosins originate – are from Pinus massoniana and P. Elliottii (Masson’s Pine and Slash Pine, respectively). Rosins sourced in the Americas are from Pinus palustris (Longleaf Pine) and P. taeda (Loblolly Pine). Mexican rosin is likely from one of several pine varieties. European rosin is from P. pinaster (Maritime Pine) or P. sylvestris (Scots Pine) or P. halepensis (Aleppo Pine). The point to be made regarding these different sources is that with so many different types of conifer trees, differences between one tree and another, and one season from another, the product is not unlike grapes to the winemaker. There will be subtle differences even within one rosin manufacturer’s brand. Some instrumentalists will opt for “all natural” rosins, although that’s slightly misleading in that there are no absolutely “pure” rosins. Some have additives (including tiny amounts of gold, silver, essential oils, powders, and gums). But even those without additives have naturally occurring impurities. In some cases, the violinist or cellist might have an allergic reaction to the dusty nature of rosin. Antihistamines are a way to fight that; for the medicine-averse, frequent hand washing and cleaning of the instrument is recommended. Bottom line: Get to know which rosin works best for you (with objective assessment from your instructor). And if traveling to a different environment, where humidity and temperatures can be different, plan to spend a day or two in advance of performing to test out rosins that other players there recommend to you.